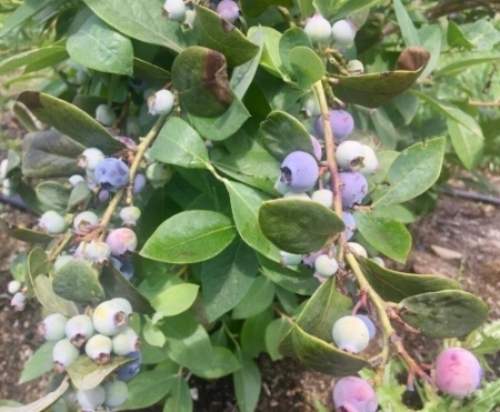 Blueberry season! This is my favorite time of the year. I love picking these berries with my family...so many fond memories with my kids (pictured below) when they were younger. We just went picking yesterday, so still creating memories! These berries are beautiful to photograph (my pictures below). And I LOVE eating them. If you search anywhere online about a healthy diet, berries, especially blueberries will pop up on the preferred list of most diets. Why is this fruit considered a super fruit? Berries in general are a great addition to any diet because of their high nutrient value and fiber content compared to their caloric content. Not to mention they taste so good. You can just see by the beautiful purplish-blue color that they are full of nutrients. Regular consumption of blueberries has been liked to better memory, lower risk of heart disease and cancer prevention. Blueberries contain anthocyanins, phytochemicals that have been shown to be beneficial to our health. Anthocyanins are the compounds responsible for giving the berry it's rich color. These flavonoids can be found in other richly colored food such as red cabbage, eggplant, red grapes blackberries or red onion. An article in Todays Dietitian explains in more detail what anthocyians are. How much do we need to eat to derive health benefits? One study shows even 3 times per week can provide benefits. The Nurses Health Study, showed "women who ate the most blueberries and strawberries had a 32-percent reduction in their risk of heart attack compared to women who ate the berries once a month or less -- even in women who otherwise ate a diet rich in other fruits and vegetables." In addition to heart health, you can find berries listed as a preferred fruit on many kinds of diets including, for cancer prevention, anti-inflammatory, DASH diet for hypertension, and the MIND diet for memory. 1/2 cup of blueberries has approximately 40 calories and 2 grams of fiber. Full of antioxidants that may be beneficial in preventing cancer and heart disease. Antioxidants neutralize "free radicals" in our body that cause damage to the DNA which can lead to cancer. Antioxidants such as those found in blueberries may decrease the incidence of heart disease by decreasing the amount of bad cholesterol that becomes oxidized in our system. They are a good source of vitamin C, folate, potassium and manganese. Some of my clients who have diabetes are often concerned about eating fruit because of it's sugar content. Berries in general are a good value food in terms of carbohydrate, fiber and nutrients. Blueberries can fit into diets of all kinds, including those for diabetes. Eating whole fruits, not taken in a juice or supplement form will provide the most benefit in terms of providing a low calorie, high fiber food to fill us up. A study led by the Harvard School of Public Health looked at whole fruit content of a diet and showed "people who ate at least two servings each week of certain whole fruits — particularly blueberries, grapes, and apples — reduced their risk for type 2 diabetes by as much as 23 percent in comparison to those who ate less than one serving per month." 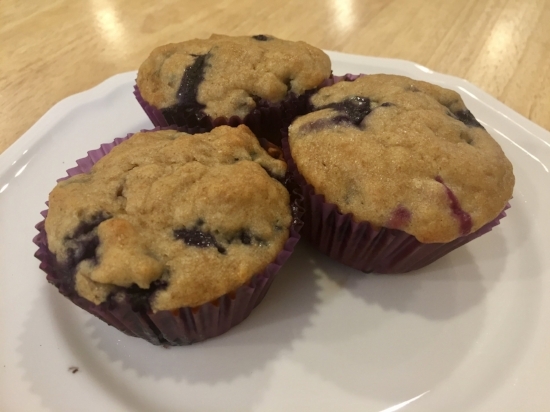 For a summary on blueberries and health, click here. Outside of just washing some off and eating them plain, this is my favorite way to enjoy blueberries, topped with greek yogurt and some toasted slivered almonds with a drizzle of honey. 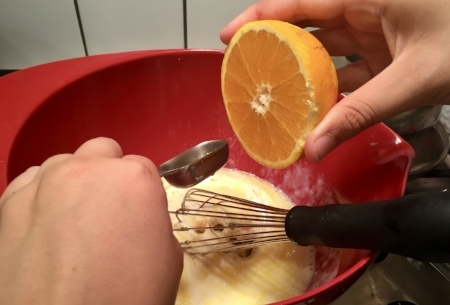 As a dessert, think about a "dessert flip", instead of ice cream with berries on top, reverse it. Try 1/2-3/4 cup of blueberries topped with a couple small spoonfuls of ice cream and some sliced almonds and coconut shreds. Putting your best fork forward suggests for us to think about the foods we are eating and strive to get the best nutrition possible. One of the best ways to do this is to be in charge of what you are eating by cooking more at home. You do not have to be a gourmet chef, just willing to experiment and try new things. We all know to have better nutrition, we need to eat more vegetables. Just by knowing that fact does not mean it translates into action. Most people will eat more vegetables if they are delicious. So we all know broccoli is healthy and probably even know it is a superfood and can help prevent heart disease and may be protective against some cancers. Some may be motivated to eat steamed broccoli on the side of their plate solely for the health value. Many though will become tired of this and need variety. In my last newsletter, I posted a broccoli soup recipe. Other yummy ways to enjoy the same food are in a salad version or roasted with other satisfying flavors. One of my favorite ways to increase vegetable intake is to add them to what I am already making. For example, you can make plain quinoa below as a side dish or with a couple extra steps, you can boost the nutrition and flavor by adding sautéed additions. Sauteed mushrooms in olive oil and a bit of white wine, added to quinoa and topped with green onion really increase the flavor (pictured in first 2 photos above). Last photo shows minced shallot, mushrooms and kale which were sautéed and later added to cooked quinoa on another day. Spinach could work in place of the kale but added way at the end of the sautéeing process since it wilts quickly. Kale can stand the longer cooking time as it is tougher. Same idea with brown rice. Instead of just a plain side of brown rice, how about adding some onion, celery and carrot? 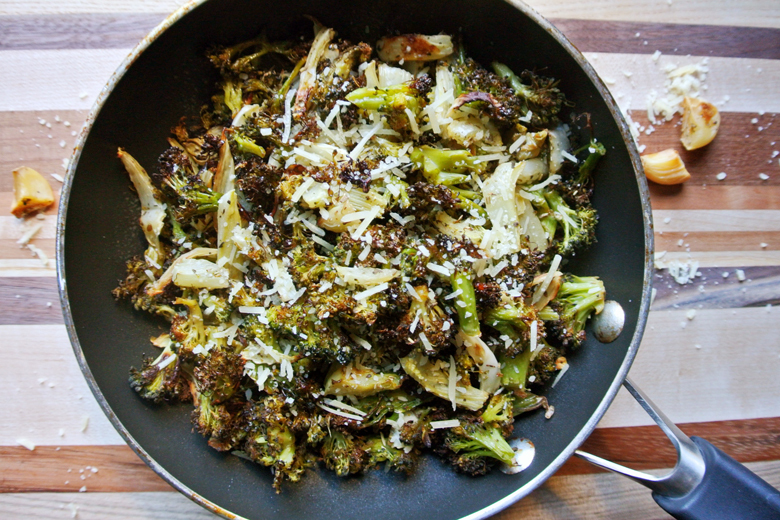 Neither of these vegetable additions mentioned will get us to 1/2 plate of veggies however, they give us a head start and make a side dish a little more intersting and definitely more nutritious! Chop 1/2 onion, 1-2 celery stalks, 1 carrot and soften a bit in pan with 1 Tbsp olive oil for about 5 minutes. Add brown rice and stir for 1 minute. Add vegetable or chicken broth and cook as directed. Yum! Simple goals for a salad, pick three colors and then vary those colors each time. Those of you who know me, have heard me suggest, "pick three colors for a salad." If you choose vibrant colors, you are getting great nutrition. A simple and easy combo is green, orange and red. Immediately you might think of lettuce, carrots and tomato but red pepper works great too. 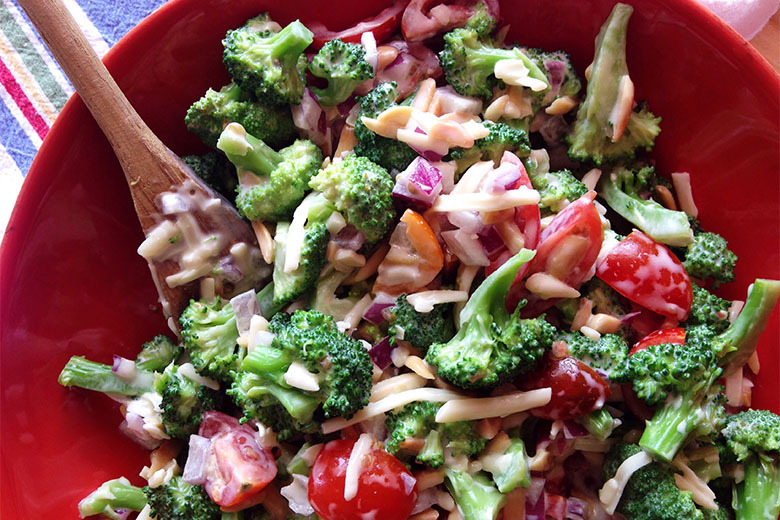 Some pre-shredded or pre-chopped veggies may help you get the job done when crunched for time. Some of my favorite convenience veggies are shredded purple cabbage and shredded carrots. Enlist the help of family members to get the vegetables on the table!! Kids love to twirl salad spinners! Vary your lettuces to keep it new. Arugula adds a spicy flavor. There are so many places to get inspiration to try new things or add vegetables in a new way. 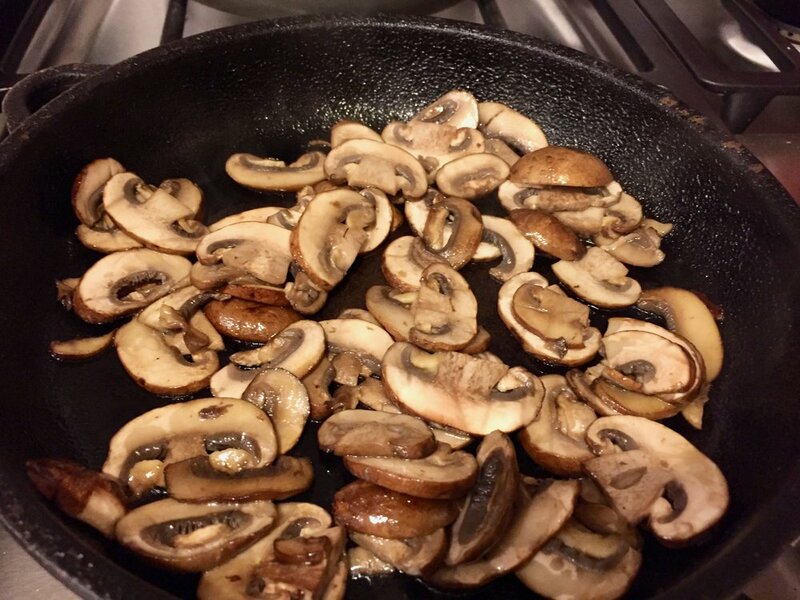 Some of my favorites are Cooking Light and Eating Well. Head over to pinterest to find loads of inspiration. I am regularly adding recipes to my own pinterest page. Feel free to check it out for some ideas. Have a great week! Be Well! Go Green For St. Patricks Day! Happy St. Patricks Day (a day early)! Seems like a good day to fit more green things into our diet, ones that are actually healthy for us! Breakfast: How about avocado toast with an egg and green pepper scramble? Avocado is full of good-for-you monounsaturated fat, folate and potassium. Snacks: Edamame is the perfect mix of carbohydrate, protein and fat for an afternoon snack, packed with fiber, folate, vitamin K, manganese and potassium. Or try the cooking light Green Pea and Parsley Hummus pictured above, with a variety of veggies. Lunch: Add a kiwi to the side of your sandwich or salad. One little kiwi packs 100% of our daily requirement for vitamin C! What a great fruit, just slice off the top of one side and you can eat it with a spoon, scooping out the yumminess! Dinner: Add some parsley to turkey meatballs for dinner. Parsley is not just a garnish but full of vitamins A, C and K as well as folate. And if you make the hummus above, you will have some on hand for this recipe! 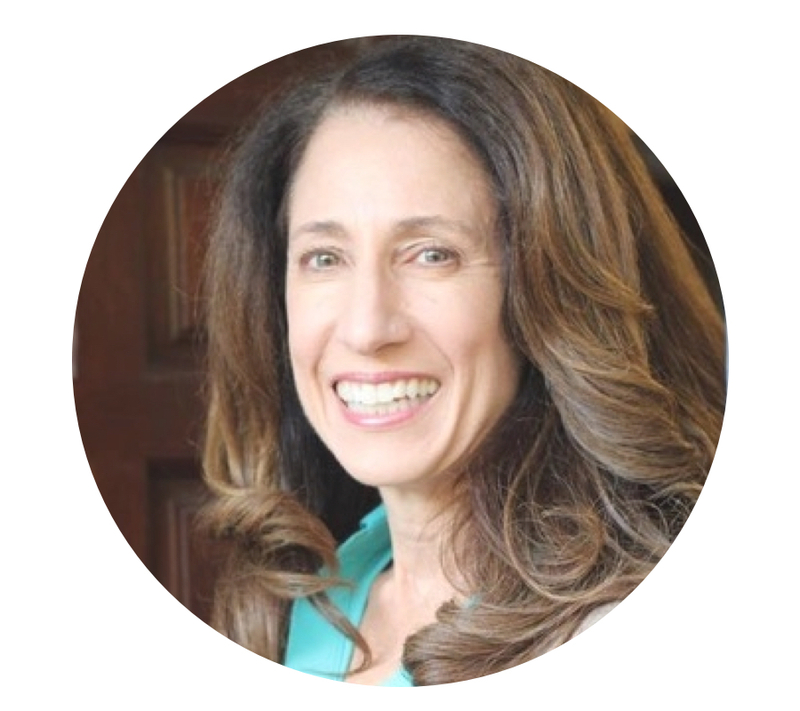 A favorite dinner recipe of mine is from Chef Joyce Goldstein presented at the Healthy Kitchens, Healthy Lives Conference, Moroccan meatballs. It calls for about 1/2 cup total chopped parsley between the sauce and the meatballs. Check out my Facebook post from May 2016 for the recipe. Have a great day! Be Well. As participants of the Healthy Kitchens Healthy Lives conference In Napa Valley, CA, we were exposed to hundreds of recipes. This was my favorite. I have never worked with lemongrass before and some of these ingredients can be hard to find. I did not want to wait until I had everything on hand to make this dish so I skipped the thai chilis and added some cayenne pepper to the marinade. I also used regular basil this time. It was still good! Next time I will experience it as written. 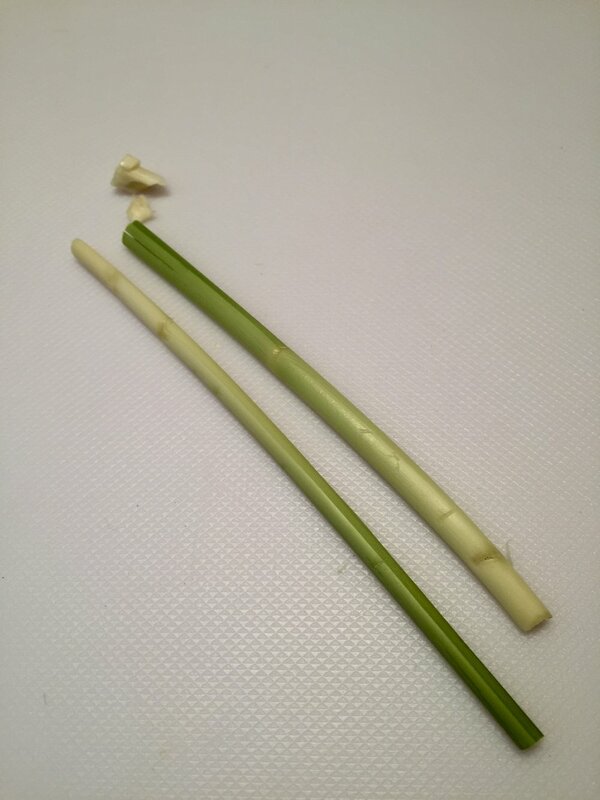 Click here for a short video on prepping lemongrass. Using a firm (not extra firm tofu) I take it out of the package and get some of the moisture out of it by placing on paper towels and then putting something heavy on top of it for about 30 minutes. 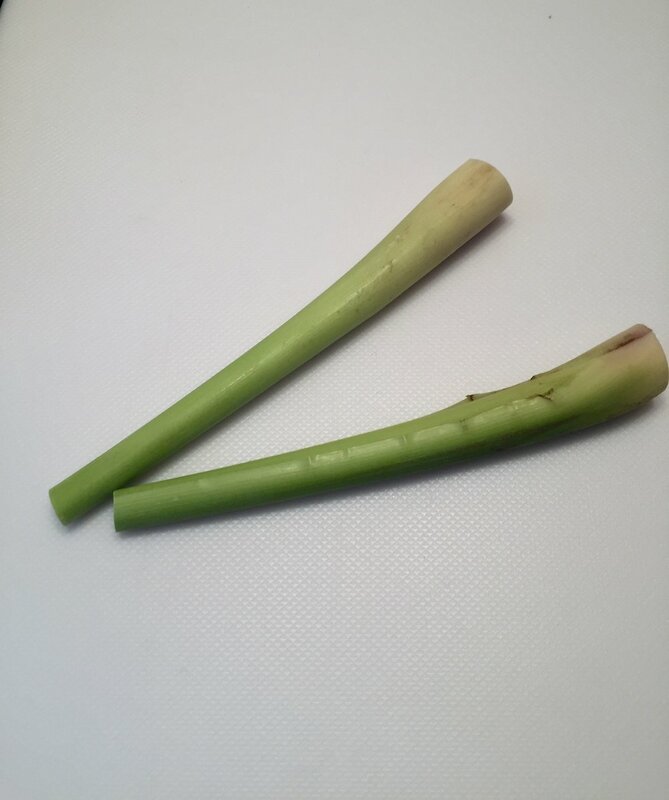 While that is prepping, you can get the lemongrass ready by first chopping it into a much smaller piece and then basically peeling it back until you get to the softer inner part. Then you can chop it and put into a mortar and pestle to pulverize it along with the chilis (not pictured here). 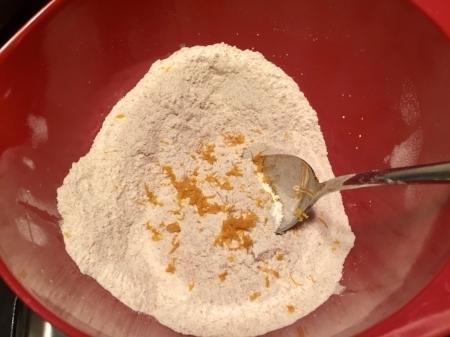 After the chilis and lemongrass are pulverized, add the soy sauce, sugar and tumeric and mix well. tumeic, soy sauce and sugar for the marinade., Onions shallots and garlic for a saucepan. Add the marinade to the sliced tofu (sliced fairly thin) and let it sit for 30 minutes. The marinade is more like a dry rub. It is not supposed to have much liquid. Add the onions, garlic and shallots to a sauce pan with 1 Tbsp oil, seasoned with some salt. The vegetables are not meant to brown, more like steam. Cook for one minute, covered and then add 1 Tbsp water and continue to cook covered for 5-8 minutes until the onions are translucent and soft, then set aside. After the tofu has marinated 30 minutes, it is time to cook in a non stick pan with 2 Tbsp of oil. 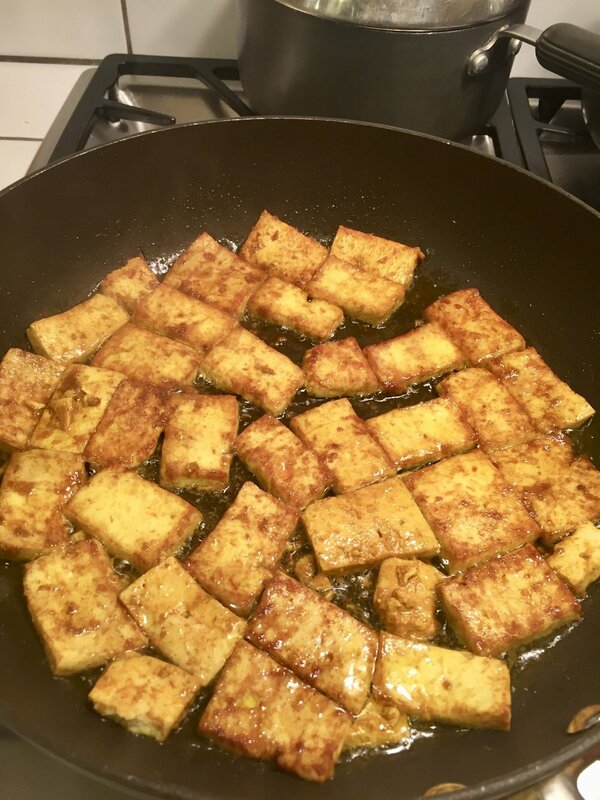 Make sure the oil is hot and then place the tofu in the pan and cook on both sides until brown and caramelized, (last picture above). 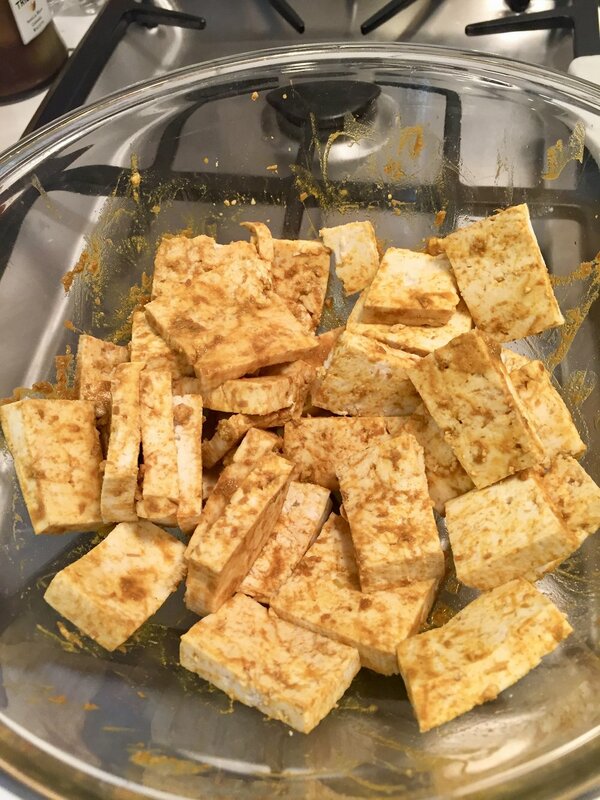 Once the tofu is brown, add the onion mixture and toss to warm and combine with tofu. Add 1/2 of the peanuts and thai basil and then garnish each plate with the rest of the nuts and basil. I served this over brown rice with some steamed broccoli on the side. Enjoy! !